This week our whole team made the trip across the United States to the East coast to share Baby Behavior in Maryland and New Hampshire! We'll be back next week with all new posts in our series on infant communication. Have a great week! I am working on a post about language development, which got me thinking about my daughters' first words. All day I've been trying to remember how old they were when they started talking and what their first words were. Luckily, I documented these types of milestones, so even though it is Friday and my brain is ready for the weekend, I know that Olivia's first word was "Dada" when she was 11 months old and Charlotte said "mama" when she was 10 months old! Last week we posted the answers to our Infant Communication Quiz, which included a question about the most common first word for babies in the US. According to a study published in 2008, the most common first words are "daddy" and "mommy," so I guess my kids are pretty representative! So now I am curious about your experience. How old was your baby when he or she said their first word and what did he or she say? Send us a comment and let us know! 1. 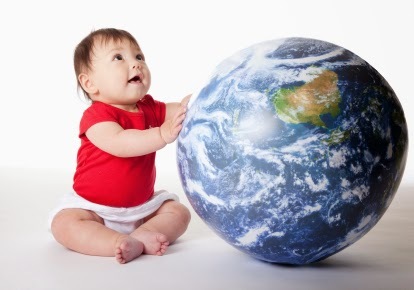 What do you think is the most common 1st word said by babies in the United States? Answer: Daddy. According to a 2008 study, the most common 1st words said by a group of 264 English-speaking babies in the United States was "Daddy", followed closely by "Mommy", and then "BaaBaa", "Bye" and "Hi." 2. At what age do babies start babbling (experimenting with sounds but not saying any discernable words)? Answer: Around 6-months of age. 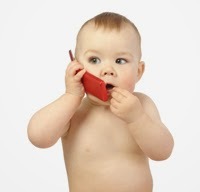 First communication starts with your baby's coos around 1-2 months followed by babbling at about 6-months. These patterns of learning language are predictable and universal. 3. 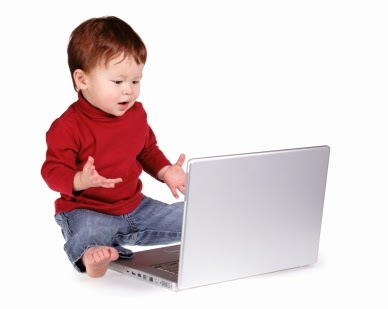 On average, at what age do babies speak their 1st words? Answer: Around 13-months. This is followed by a rapid expansion of your baby's vocabulary around 18-months. 4. True or False. You can help early vocabulary development by labelling specific objects for your baby, i.e "that is a block!" Answer: True! Attaching a word to a specific object can help infants learn new vocabulary. Describing what you or your child is doing as it happens is also helpful. 5. True or False. Focusing on motor development, like learning to crawl or walk, can temporarily take your baby’s focus away from learning to speak. Answer: True! Though this effect is brief, if your baby is intent on learning to walk, he may be so focused on that skill that he isn't as intent on learning new words. As soon as he masters walking though, he'll be back to learning to speak. 6. At what age do babies start recognizing words for common items? Answer: Between 7-12 months. Sometime around 7-12 months your baby will begin to recognize common words such as "cup", "milk" or "shoe." 7. At what age is your baby able to follow directions? Answer: Between 18-months and 2 years. At this age you can begin to ask your child to help you with simple tasks like bringing you her cup or picking up her shoe. 1: Tardif T, Fletcher P, Liang W, Zhang Z, Kaciroti N, Marchman V. Baby's First 10 Words. Developmental Psychology. 2008;44(4): 929-938. With 14% of postpartum women in the US screening positive for depression, according to a 2013 study, it’s important to understand how depression affects infant sleep and how infant sleep (or lack of maternal sleep) affects depressed mothers and their babies. We all know that night waking with an infant and nighttime parenting are stressful, both physically and mentally. But for depressed mothers, how is it different? The authors of a recent study proposed 2 potential explanations for how nighttime infant behaviors and depressed mood of mothers are related. It’s a question of what comes first. Does the infant’s night waking lead to more maternal involvement at night and thus sleep loss predisposing the mother to depressive symptoms? Or do the mothers’ elevated symptoms of depression predict more involvement with the infant during the nighttime, even without infant distress, and does that cause increased night waking? Let’s take a closer look at the study to see how these questions were answered. Depressive symptoms were measured in 45 mothers of infants between 1-24 months of age. The mothers kept diaries about their infant’s sleep (i.e. sleep location, number and duration of night wakings) for 7 days. Also, a video of bedtime/nighttime interactions for 1 night and a survey of maternal thoughts/reactions to infant night waking (such as “It is all right to allow my child to cry at night” and “I am able to resist my child’s demands when he/she wakes at night”) were collected. 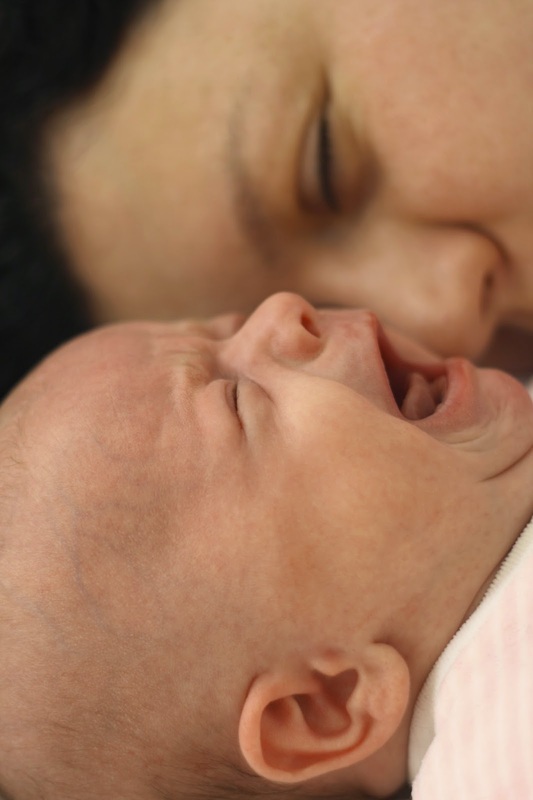 Depressed mothers had infants with more night waking. Mothers who were more worried about their infants’ nighttime needs had babies that woke more at night. Depressed mothers reported more thoughts of helplessness around infant night waking. Depressed mothers were more worried about their infants’ physical/emotional needs at night. Mothers’ thoughts of helplessness/loss of control around night waking were not associated with infant night waking. Depressed mothers spent more time with their infants during the night. Mothers who were worried about their infants’ physical/emotional needs at night were also more likely to spend more time with their infants at night. The authors concluded the following: The more depressed feelings a mother had, the more time she spent with her baby at night, and the more time she spent with her baby at night, the more night waking her baby had. Also, the more a mother worries about her baby at night, the more time she spends near her baby, and the more time she spends near her baby, the more times her baby wakes up. That’s a mouthful! Before we clarify what all this means, let’s take a look at a few other findings of this study. That’s a lot of information to process! So, what’s the bottom line? Maternal depressive symptoms and infant night waking are linked. However, because of the type of study, we can’t positively say that the mother’s depressive symptoms caused the infant night waking, or vice versa. We just know that certain behaviors are associated with another behavior. Maternal worries about the nighttime needs of her infant are also linked to infant night waking. Depressed moms were more likely to be hyper responsive to infant nighttime needs, to the point of waking their sleeping infant and were more likely to have an unstructured bedtime. Now if you’ve been following our blog, you know that following a regular calming bedtime routine can lead to less night waking! So, if depressed mothers are more likely to have infants who wake more and are less likely to use bedtime routines, there could be a connection. Now here’s another baby behavior connection. The authors recommended parenting education on reasons for nighttime crying to reduce maternal stress about nighttime parenting. It’s possible that information about normal infant sleep patterns would also reduce stress at nighttime. The authors believe mother-driven influences are at work from what they observed in the study. Though it can’t be ruled out that the infant night waking actually predisposed the mothers to spend more time with their infants at night, which in turn caused depressed feelings or excess worry about infant nighttime needs. It’s important to note that this study was done with a relatively low-risk sample of mothers, not with mothers with severe or clinical depression. If you have depression and are a new mom, or if you know someone in this situation, understanding about normal infant sleep and crying may be helpful to alleviate some of the stress around nighttime parenting. Here are some links to the basics about infant sleep and crying. Also, if you or someone you know is depressed, please see a doctor, or encourage them to see one. There are many effective treatments for depression that can help. For more information about postpartum depression, click here. Teti DM, Crosby B. Maternal Depressive Symptoms, Dysfunctional Cognitions, and Infant Night Wakin: The Role of Maternal Nighttime Behavior. Child Development. 2012;83(3):939-953. Wisner et al. Onset timing, thoughts of self-harm, and diagnoses in postpartum women with screen-positive depression findings. JAMA Psychiatry. 2013;70 (5):490-8.